Stephen Colbert will star in a new ad during Monday night’s Emmy Awards, but it will only be seen by ceremony attendees at L.A.’s Microsoft Theater, not the TV audience that will be watching on NBC. 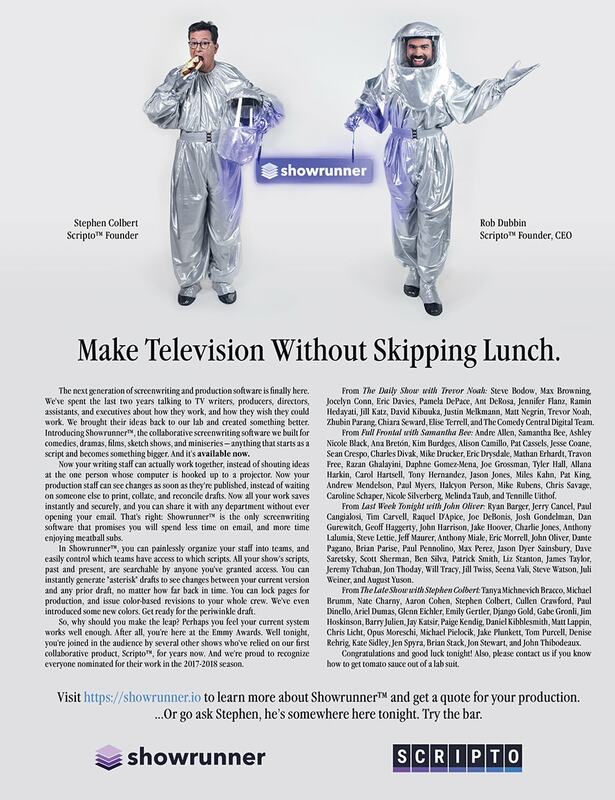 Instead, The Late Show With Stephen Colbert host, who emceed last year’s Emmy ceremony when it aired on CBS, appears in an ad that is part of the official Emmy program, touting a product called Showrunner. 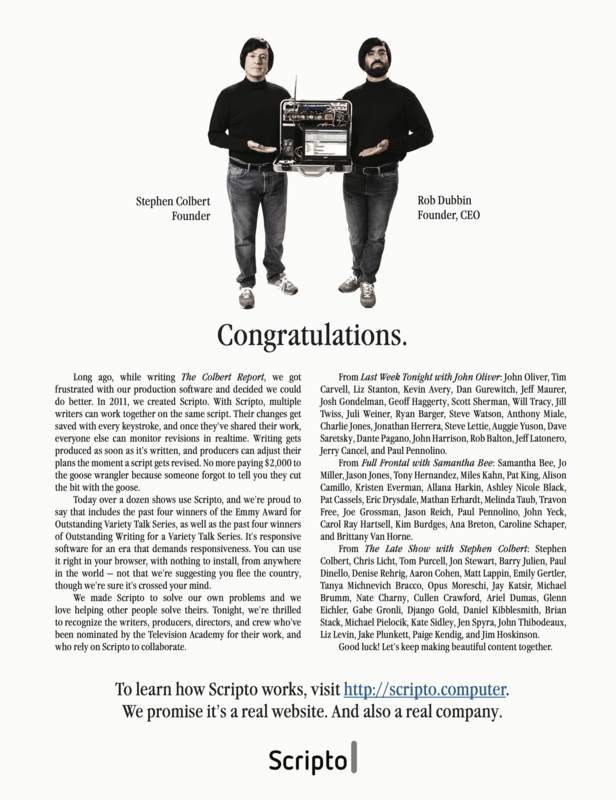 It’s a new collaborative screenwriting software from his tech company, Scripto, that helps TV writing and production staffs work faster and more efficiently together. 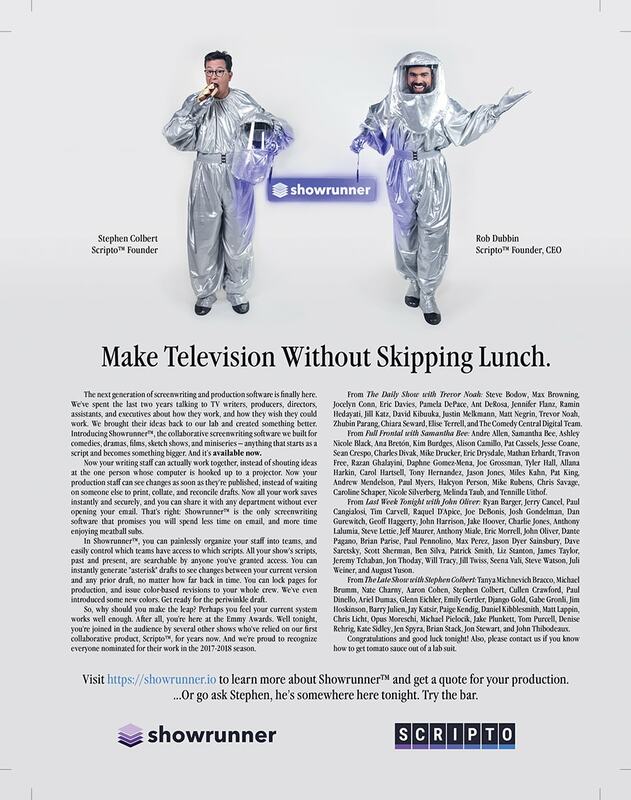 In the full-page ad for the Emmy program, Colbert and Rob Dubbin— a former Late Show and Colbert Report writer who is Scripto’s CEO and co-founder (alongside Colbert)—spoof the Intel “bunny people”: the dancing, “bunny suit”-clad mainstays of Intel’s Pentium campaign for years, beginning with a 1997 Super Bowl ad for the Pentium MMX. This is the second consecutive Emmy program containing a Scripto ad featuring Colbert and Dubbin. Last year, the duo dressed as late Apple CEO and co-founder Steve Jobs, complete with black turtleneck and jeans, to promote their first screenwriting software product, called Scripto. 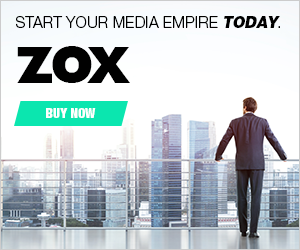 “We were parodying old tech to introduce our new tech,” said Dubbin. The duo decided to advertise in the Emmy program, and not a showbiz trade publication, because “the Emmy audience is full of people at the top of their game,” said Dubbin, who has attended several ceremonies as a Colbert Report writer. “I was also aware of the fact that there’s some pretty significant downtime in that ceremony, and so the Emmy program is a great way to reach a concentrated audience of working TV professionals who understand the challenges of making entertainment. But also it’s an opportunity to make people laugh a little bit and stand out in that program,” he said. 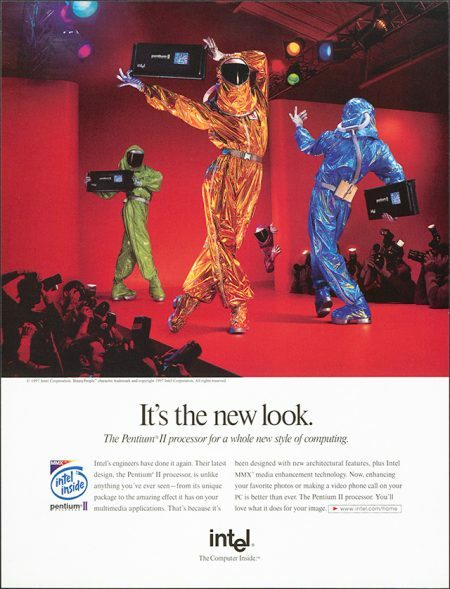 The ‘bunny suit’ Intel Pentium campaign that inspired Scripto’s ad. Because of that captive audience, Scripto’s ads are much more text-heavy than a typical advertisement. Dubbin, who wrote the copy, wanted to explain the product, congratulate the nominees who use Scripto (including writers from The Daily Show With Trevor Noah, Full Frontal With Samantha Bee, Last Week Tonight With John Oliver and The Late Show With Stephen Colbert) and add a few jokes (“Congratulations and good luck tonight! Also, plus contact us if you know how to get tomato sauce out of a lab suit.”). It’s likely that Colbert and Dubbin will continue the tradition with an ad in 2019’s Emmy program, as well. “What I like about this concept is how it opens up the future for us to advertise with other callbacks to vintage tech, and to expand that world outward as we continue to serve this community of professionals that work real hard and make cool stuff,” said Dubbin.